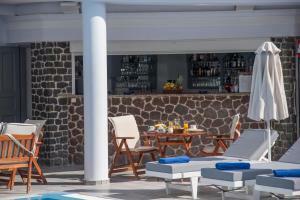 The Blue Waves is located in Santorini, just 30 meters from the black sand beach of Kamari. It has a pool, a solarium and a bar next to the pool. Traditionally decorated suite, located just 30 meters from Kamari Beach, equipped with air conditioning and private hot tub. It opens onto a private veranda and a rooftop terrace with a private hot tub. It also has a kitchenette with a dining area, fridge and stove. The bathroom is private and includes a hair dryer. 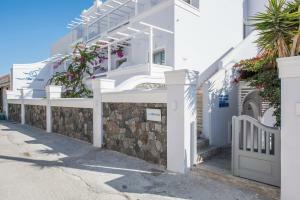 Apartment with air conditioning, located just 30 meters from the beach of Kamari. It has a balcony with mountain views and a kitchenette with a dining area, fridge and stove.The private bathroom includes a hairdryer. Apartment with air conditioning, located just 30 meters from the beach of Kamari. It has a balcony with mountain and pool views and a kitchenette with dining area, fridge and stove.The private bathroom includes a hairdryer. 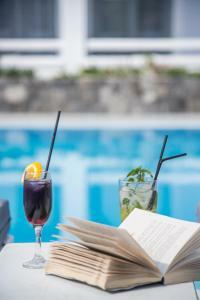 Modern junior suite with a hot tub, air conditioning and a balcony overlooking the Aegean Sea. It has a seating area with a flat-screen satellite TV and a kitchenette with a small fridge. Includes free toiletries and a hairdryer. Modern suite with a private pool with hydromassage jets, air conditioning and a furnished balcony overlooking the Aegean Sea. It has a seating area with a flat-screen satellite TV and a kitchenette with a small fridge. Includes free toiletries and a hairdryer. 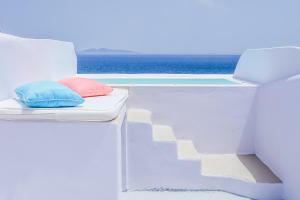 This suite features a spa bath, air conditioning, a furnished balcony and views of the Aegean Sea. It has a seating area with a flat-screen satellite TV and a kitchenette with a small fridge. Includes free toiletries and a hairdryer. Apartment with a balcony, a kitchenette and a CD player. The family suite has a private porch with a private pool. This accommodation features a romantic private bedroom, an elegant living area, a luxurious bathroom with a bath and shower, a private spa bath and a veranda overlooking a private hot tub.